Over the past few days, two incidents occurred which together, tell us the story of the Israeli Left. Monday night, Channel 10 revealed that the Labor Party has no regard for Israel’s national interests. Channel 10 disclosed that ahead of the 2015 Knesset elections, Labor – and now Zionist Union – leader MK Yitzhak Herzog engaged in private negotiations with PLO chief and Palestinian Authority leader Mahmoud Abbas. During the course of their meetings, Herzog signed a letter, which he sent to Abbas. Among other things, in the letter Herzog pledged that a government under his leadership will withdraw from all of Judea and Samaria, partition Jerusalem, surrender Israel’s security control over the Jordan Valley, permit the immigration of Palestinian “refugees” into the post-withdrawal rump Jewish state, and place Israel’s counter-terror operations under the control of a joint Israeli-Jordanian-Palestinian security committee. Abbas for his part, agreed to a “symbolic” Israeli security presence in the Jordan Valley. Whether Abbas agreed to Herzog’s offer is unclear. But it is also unimportant. Herzog, as opposition leader, has no authority to negotiate on behalf of Israel. And Abbas knows it. So even if he did agree to Herzog’s terms, his agreement is meaningless. Abbas can agree to whatever he wants in the framework of pretend negotiations with pretend Israeli leaders. None of his statements bind him. Herzog didn’t deny the report. Rather he said he held his private talks with the PLO chief in an effort to prevent a new Palestinian terror wave. In other words, Herzog surrendered Jerusalem, and signed the eviction notices of hundreds of thousands of law abiding Israeli citizens to appease Abbas, lest he set off a new terror war against Israel. Herzog added ruefully, that his efforts failed. Again, translated into normal language, Herzog admitted that Abbas went ahead and issued the kill orders against Israelis, despite Herzog’s efforts to forestall them by making an unauthorized offer to give Jerusalem to a murderer. Abbas hasn’t survived as the unelected leader of a terrorist group and of the PA for the past 12 years because he’s stupid. Abbas knows what he is doing when he “negotiates” with the likes of Herzog. He’s been running so-called “Track 2” negotiations with Herzog and his colleagues and predecessors on the Left for more than twenty years. Abbas has repeatedly engaged in phony negotiations with Herzog and his ilk because it serves his interest to do so. Israeli leftists are critical partners in the PLO’s political war against Israel. The goal of the PLO’s political war is to criminalize the Jewish state by castigating it as the “occupier” and “settlement builder” that blocks all efforts to achieve peace. By agreeing that the elected government is recalcitrant, the Israeli Left proves Abbas’s point. By reaching phony deals with Abbas, these leaders absolve him of all responsibility for the absence of peace. The most obvious reason that Herzog and his colleagues engage in these operations is because they believe that weakening the elected government strengthens them. 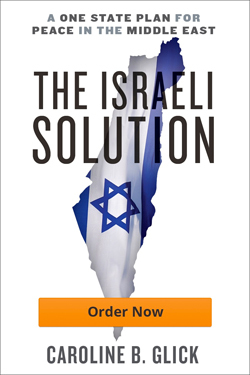 They see Israel’s national interests not as something common to all the country’s citizens, but as chips to be gambled away in their bid for political power. Joining the PLO’s political war against Israel, they believe, improves their chances of beating Likud and the other right-wing parties at the ballot box. But there is another – equally, if not more powerful — reason that Herzog and his fellow leftists openly subvert the government and carry out unauthorized and arguably illegal phony peace talks with the PLO. They are motivated by hatred. The Israeli Left doesn’t merely view itself as the political rival of the Right. They view themselves as engaged in a life and death struggle with right wingers – and particularly the national religious camp. And this death struggle is not based on political calculations. It is based on pure, irrational and uncontrollable hatred. Which brings us to the second big story about the Israeli Left. Saturday night, Ofer Newman, who serves both as Herzog’s personal spokesman and as spokesman for the Zionist Union, published a post on Facebook that most Nazis would be comfortable signing on to. Arguing for the mass imprisonment of the Jews who live beyond the 1949 armistice lines Newman wrote in a manner that echoes medieval blood libels. After Newman’s remarks were publicized, Herzog said he yelled at him and Newman said he didn’t mean it. But of course he did. When her remarks caused an uproar, she corrected herself, noting that not all so-called settlers are crazy, some are sane. Which was nice. The Left’s boundless, unhinged hatred for the religious Right, along with its continuous subversion of the national interest in order to advance its bid for power has caused Israel enormous, strategic damage. The entire initiative to withdraw from Gaza, and destroy the Israeli towns and villages in the area while expelling their predominantly religious Zionist residents was predicated on a desire not to advance national security, but to destroy the religious Right. Haaretz and other leading leftist voices admitted openly that endangering the country by surrendering Gaza, along with Gaza’s border with Egypt, to terrorists was a small price to pay for destroying the religious Zionist movement. A month before the August 2005 expulsions, Haaretz published an editorial, which explained that it really didn’t matter whether Israel’s security was damaged by the withdrawal. The real question,” the paper argued, “is not how many mortar shells will fall, or who will guard the Philadelphi Route [between Gaza and Egypt], or whether the Palestinians will dance on the roofs of [the destroyed communities]. Israel has fought three wars with the Palestinians and one with Hezbollah since that withdrawal. Hundreds of soldiers and civilians have been killed. Thousands have been wounded. Whereas 25,000 Israelis lived within range of Palestinian mortars and rockets from Gaza in July 2005, today Hamas’s missiles have a range covering nearly all of Israel. Today we are subjected to daily claims by Leftist politicians, activists and their media partners that Israelis are tired of Prime Minister Binyamin Netanyahu. His days in power are over. The “public” now sees that the Left is the only side that brings hope so it behooves the government to listen to the “public” and let the Left rule for a change. But to the dismay of the Left, the public won’t go along for another ride with them, no matter how much hysteria they promote. Despite the best efforts of Herzog, Newman, and their allies in the media echo chamber, the public has taken their measure. The public is not interested in electing parties that subvert the national interest to advance their political fortunes. The public is not interested in being led by men and women driven by an irrational and dangerous hatred of their fellow Israelis.